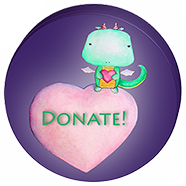 You can support the dragon by your daily efforts in keeping peace within your own heart! We would love to come and draw dragons, tell the story, sing the song, create and event of peace within your neighborhood. Please contact us below. The Peace Garden Guardians: Grow a friendly neighborhood reminder with our cardboard peace dragon structure; a little dirt and some seeded hearts and the wishes of your friends can make this happen. Keep checking or contact us below to be on the mailing list. Any ideas, suggestions, offers – send them on! *The Peace Dragon is a 501 (3) C Educational, Not for Profit, publically funded organization.